Cereal Slogans is a fun game that you can play with a teams, up front or individuals. However you decide to play, it’s sure to get some taste buds stirring! The basic premise of Cereal Slogans involves matching cereals to their slogan. In that sense, the game is very simple. Below we will detail how you can play as individuals, in teams or utilize it as an up front game. This one is easy. Just print the Cereal Slogans game sheet (includes Answer Key) and hand out to participants. Have them keep it face down until everyone has one and then have them match it up as quickly as possible. The first person to get them all right is the winner! Form groups of 10 and have them line up in a single file line. Have the names of each cereal printed and placed on the wall (you can have the actual boxes on a table, but it’s a much more expensive way to play!). Print out the names of each slogan on a piece of paper and hand out one to each player. Have them run up and match the slogan to the cereal one by one. When the first person is done, they will tag the next person and then they will go and so on. Once all 10 are hung/taped, have someone check to see how many they have right and relay that number to the team. They can then all go to try and make adjustments until they have all 10 correct. Whichever team does so first is the winner! This works best if you have the 10 boxes of cereal for each of the three contestants. Take a long table and tape the slogans to the edge of the table so the slogans are visible to the contestants and the audience. Give each player the 10 boxes and see who can correctly place them all first. Whoever does so is the winner! To save money on this one, you can purchase 10 boxes and have each contestant go one at a time, making sure to keep the next contestants out of the room until it is their turn. Time them and then have the next person come. This method works, but don’t go beyond three since it becomes anti-climatic for the audience. 1. Award the winner(s) with some boxes of cereal! 2. We selected 10 staple cereals that are found in most US grocery stores, but feel free to add more cereals and slogans to the game that might be native to where you are. 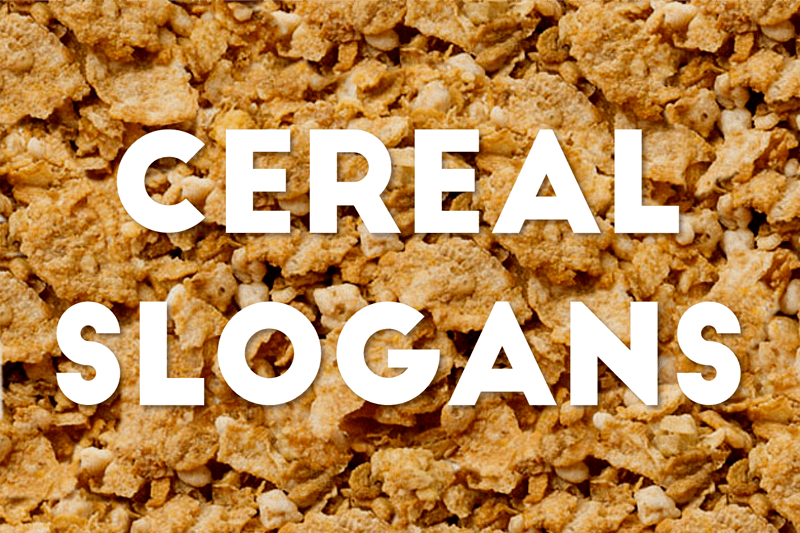 You can download the editable word doc here: Cereal Slogans.